It seems Indian Government is also started using Social Media effectively. Today (September 25th, 2012) we had seen a Press conference of Indian Govt Official on Twitter first time. The Twitter press conference was conducted by Sam Pitroda who is the Adviser to the Indian Prime Minister on Public Information Infrastructure and Innovations (PIII). The Twitter conference started at 3:30 PM IST to discuss about "Democratisation of Information". And, this conference uses #DoI as hastag. And this hastag #DoI was trending for many hours in India. 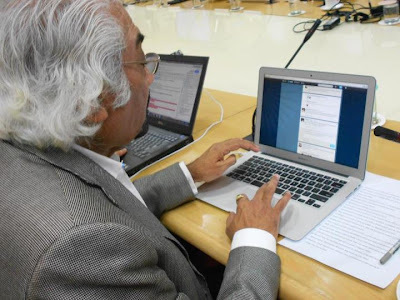 Sam Pitroda uses the Twitter Handle @pitrodasam for this online twitter Conference. Right now he is having 29K Twitter followers. Sam Pitroda is the key person in bringing Telecom revolution in India. Apart from being the Advisor to PM, Same Pitroda is an Inventor and Entrepreneur. Sam Pitroda had started the conference by asking his Twitter followers to watch his YouTube video about "Democratisation of Information". And Sam explained the reason for using Twitter for the online conference. Then Sam Pitroda has announced "#DoI" as the hastag for today's conference. And, he says, "I firmly believe that #Information is the 4th pillar of #democracy along with legislature, executive and judiciary"
And, then Sam Pitroda has given below information thro multiple tweets. Information brings about openness,accessibility, transparency, accountability, networking, decentralisation & as a result #democratisation. Public #Information Infrastructure (PII) will transform India’s 1.2 billion people into 1.2 billion opportunities. UPA Govt has various plans to build robust Information Infrastructure to democratize information on a scale that has never been done before UPA Govt also has political will to make it happen. This will have far reaching implications on delivery of #public services, #Governance, #Education, #Health, #Agriculture, etc. However, it will require new mindset and commitment of the young to change the course. I believe that the NKN is a game changer and is going to revolutionise the way we #connect, #collaborate and deliver #education. The NKN has enormous possibilities: Virtual Classrooms, Research Collab, etc. We have the #open government platform at http://www.data.gov.in will provide access to govt. data and documents.We need your support and help in making this happen. Please visit our websites and give us your ideas and inputs. All this will require innovations, new business models, process reengineering, new products and new services and lot more. Then Sam Pitroda has started answering questions asked by the Twitter users. Question:Is democratization of info possible without a radical change in the mindsets of our legislators and bureaucrats? Answer:No. But we need to start now. It will take time. Question:What does #DOI "Democratisation of Information" mean for a villager who does not have access to information? Question:how can wireless broadband internet access be scaled up to the ubiquity achieved by the STD booth that revolutionised telephony? Question:Will DOI have the same fate as RTI? National security and till when will it be used to curtail info? Question:the project to connect 250k panchayats has been talked about for years-cud u tell us what is being done to speed it up? Question:Why is computerization of tasks, performance monitoring and evaluation not being done in Ministries, Govt. departments. Answer:We are infact doing exactly that! Delhi High Court is a good example. Question:Appreciate the National Knowledge Network #DoI How can such a network be replicated amongst districts in a state? Any Plans? Question:why a separate infrastructure and investment is needed why can't the existing network be used ? Question:Why u think that democratization of information means only the information provide by Government? Answer:Agree. It is not just govt. Education ,Health,Agriculture,etc is more for the people and by the people. Question: I would want to use the data at http://data.gov.in in useful apps for people, but will it be updated with latest copies of it? Question:how can citizens contribute to this agenda? Question:Sir please elaborate about NKN. The report has been submitted long ago but nothing substantial has happened. Situation now? Question:How will you go about executing the idea and in how much time? Answer:Various dept will decide that. First there will be some concerns. However, I am sure after a while dep will be more open. Question:250,000 Panchayats with OFC..any time line and budget allocation for the same? Question:All info would be made available or do restrictions apply? Answer:Depends on the source of the info. Question: sir in process to implement e governence what is biggest hurdle-power or lack of initiative? Answer:Reengineering of processes is a big hurdle! Question:Apart from connectivity, what concrete policy changes are planned to democratise information? What synergies with RTI? Answer: It starts with RTI. To back it up, we need PII. And then provide access to real time info to ppl on demand. Question:Why is internet access, which is a basic right in many countries, so expensive in India? Question: will UPA deliver NOFN within this term? Watch the below slideshow about PIII initiatives in India.